Preparations are underway for the celebration of the centenary of the Carmelite Hall in Middle Park. 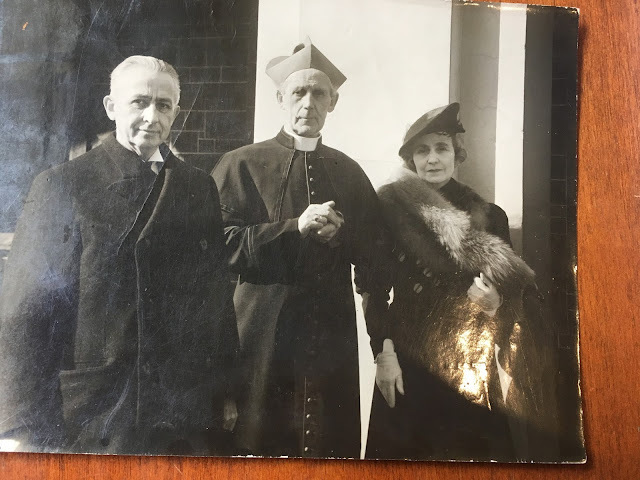 Archives are admitting to all sorts of treasures, including this photograph of Marcel Dupré (1886-1971)and his wife, with Archbishop Daniel Mannix. At the time this picture was taken (1939) Dupré was Professor of Organ Performance and Improvisation at the Paris Conservatoire; in 1954 he became Director of the Conservatoire. He was a prodigy. For example, in 1920 he gave a recital series in Paris of ten concerts of the complete works of Bach performed entirely from memory. His world tours took in Australia, including “a memorable organ recital” at Our Lady of Mount Carmel Church in Middle Park. 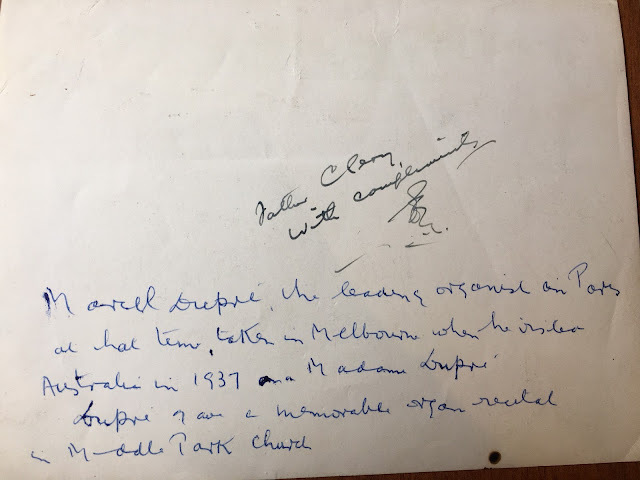 The verso of the photograph contains compliments to Fr Paul Clery O.Carm., priest of the Middle Park Church, signed with the recognisable squiggly initials of Daniel Mannix. Another hand has written later in blue biro: “Marcel Dupré, the leading organist in Paris at that time, taken in Melbourne when he visited Australia in 1937 with Madame Dupré. Dupré gave a memorable organ recital in Middle Park Church.” Our scribe means 1939; Marcel and Jeannette Dupré's only visit to Australia was June through August. Their departure from Sydney for Vancouver was on the 31st of August 1939, only four days before the outbreak of the Second World War. Photographs of inscriptions by Susan Southall. 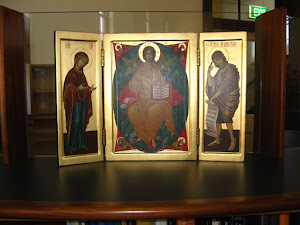 Today the Calligraphy Society of Victoria takes down another show of recent work, here in the Carmelite Library. This was a small show, held to coincide with the visit to Australia of Patricia Lovett MBE, one of England’s leading practitioners and historians in calligraphy. Patricia gave a lecture on the subject in the Library in late December. A marvellous side benefit of the Library’s collegial friendship with the Society is inscriptions. 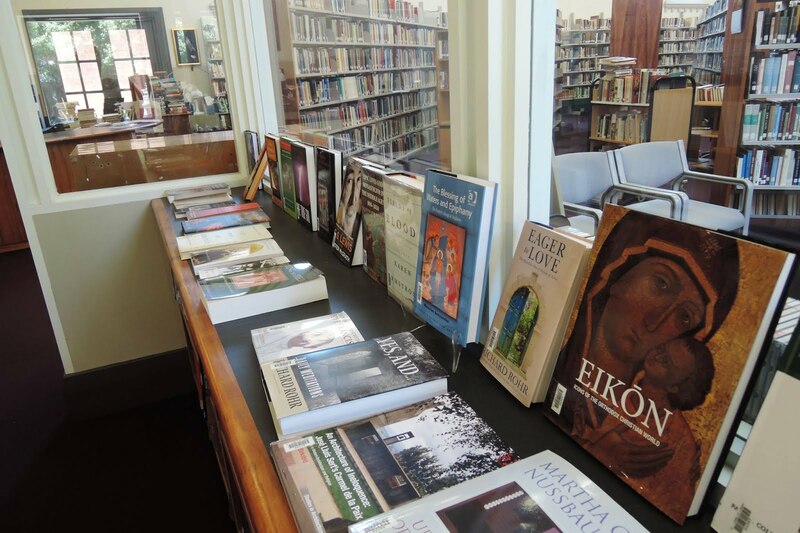 When, in August 2016, the Society put up its Workshop Works show, the Library was presented with a thankyou gift of ‘Gospels and Acts’, the Saint John’s Bible volume handwritten and illuminated by Donald Jackson. A simple handmade gold-edged bookplate did the job. The orange flyleaf is covered with a dedication to the Library in honour of the event in December. On the day in question, Patricia Lovett signed copies of her magnificent new book, ‘The Art and History of Calligraphy’, published by the British Library. She used a special broad nib pen and brown ink to write ‘Carmelite Library’, and a black biro to sign off with her name. Another excellent acquisition to add to our collection of calligraphy books. Theologians do not steal books, it is assumed, because theologians are aware of the commandment about theft. This assumption was once challenged by a colleague who said to me, straight-faced, that if a theologian is called by a higher power to have that book, to read, learn, and inwardly digest the book, then rules and regulations will not get in the way of their calling. They will have the book by hook or by crook. This logic needs to be challenged by the knowledge that a light-fingered, not to say light-minded, theologian has other friends and colleagues, people we call neighbour, who also want the same book and may hear the same call. This facetious dialogue about borrowing and theft in the library came to mind while reading a thread on Atlantis this week. Atlantis is the e-list of the American Theological Library Association (ATLA). I quote the discussion in order, with contributors’ names given at the end to protect the innocent, and even the guilty, for all I know. A opens up the question thus: “I’d be interested to hear from other ATLA libraries about what you do to prevent theft. I’m not actually thinking about theft of our books (most have security strips, but I know that does happen as well.) No what I am thinking of is theft from patrons. Our students and visitors tend to leave their backpacks, laptops, cellphones, pocketbooks etc. unattended on tables and in carrels around our library. And then they are shocked and upset when something gets stolen.